Did you know that real estate photography is one the most important aspects in selling your home? In fact, according to the National Association of REALTORS, more than half of all buyers found the home they purchased on the Internet. However, being able to capture the essence of a home is not easy to do. Photos need to properly show the right areas of the house, with the right light, and the right angles. If you can master this craft, you can find yourself selling your house much faster and for more profit. Studies have shown that quality real estate photography is more likely to generate a higher price per square foot. 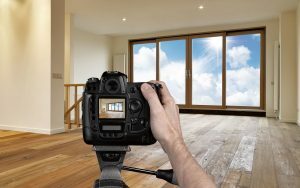 Here are four important factors that come into play when trying to sell your home through photos. Your curbside photo, or what the buyer sees from the street, should be the first photo that buyers see online. When shopping for a home on the Internet, buyers are essentially taking a virtual drive around the neighborhood. They would like to see the curb appeal first. This photo should be perfection. If your house needs paint or a power wash to appear best in photos, do it. This will be your money shot. Update an old garage door if need be (deemed to be the most valuable renovation of 2018). Check for the perfect time of day. Avoid any time of the day when trees or buildings cast shadows on the house, etc. Choose a day with a clear sky to do your photography session. The blue sky helps to make your house pop. Clean up your landscaping. You don’t want the yard to become an eyesore. Before you take your photos, make sure the lawn is cut and in top shape. While you want to take a lot of photos, there is such a thing as too many photos. It can overwhelm a buyer and cause them to lose focus. More often than not, however, it is that too few photos are posted. It’s important to include individual photos of the living room, kitchen, dining room, family room, master bedroom/bathroom, backyard and any additional feature worth showing. Highlight additional assets to draw interest from prospective buyers. This can include any views your property may have of the beach, a lake, mountains, a golf course. Emphasize the characteristics that will impress buyers, such as an office space, finished attic, or reading area. Take a photo of each bedroom and properly label them as such so that a buyer can imagine his or her family living there. With all of today’s technology and online tutorials, a non-professional photographer can take some excellent pictures of a property. However, there are still plenty of simple mistakes that can make your photos appear unprofessional. Take the time to research and understand what makes a photo sell a home before you take photos. It’s a great idea to search a few online databases and take some notes. What did you like about a set of photos? What made you want to move on to the next listing? Make sure to avoid having yourself in the mirror of any photo you take. Do not allow any of your pets to be in any photos. Take down any personal photos before you take pictures of a room. Clean up your space before you photograph them. Try to use a professional camera, or borrow one if you don’t have one. Do not take vertical photos. Every photo you plan to feature should be taken in landscape mode to emphasize the characteristics that make a house a home. Do not use a fish-eye lens, as these make images immediately appear amateur. As you can tell, there is a lot that goes into taking decent photos of your home. Being that this is essentially the storefront for what you’re selling, you really want to get the most out of them. That is why so many people opt for hiring a professional photographer to ensure the job is done right. A professional photographer will bring the right equipment, understand how to capture your home in the best light, and best of all, they will be excellent with editing your photos. Digitally editing photos can take a lot of time, but it is well worth it. Prospective homebuyers will gravitate toward the properties that display the best photographs. Those that have been enhanced tend capture the attention of a buyer much easier. Here at The MD Home Team, we offer professional photography on all of our listings. Stay tuned for our next blog post on how a professional photographer can take your listing to the next level.